Papa loves all of his 8 grandchildren with great gusto. He has greatly rejoiced with all eight announcements of their arrival and would love for my sister and I to have even more! (In the hospital, as he held my second daughter on the second day of her life, he looked over at me wearily reclining on the hospital bed and asked when we were having the next one!) He loves to hold them as babies and feel their baby skin next to the crook of his neck. He even enjoys burping them and especially loves rocking them to sleep. (Diaper changing...not so much). And, of course, he did all of this with Declan, and maybe more so because we parents were dealing with two other children when he was an infant. 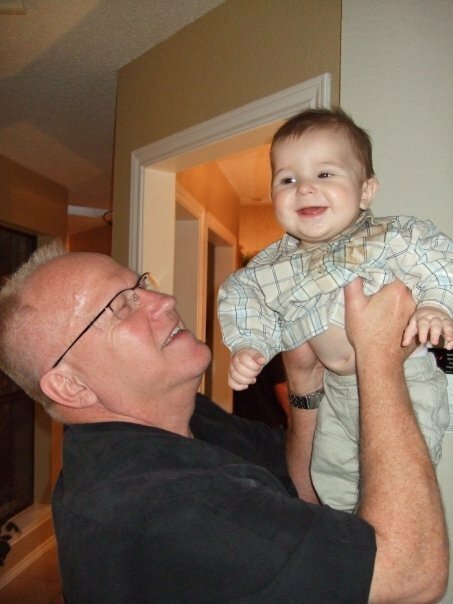 It was great that Papa would hold him on the couch and snuggle him while my husband and I worked with his two older sisters on diaper changes, trips to the potties, getting food served up, etc. As a result, they have a wonderful bond. As he grew, Declan lived for trips to Papa & Grammie's house. Much to my mother's chagrin, Declan seemed to only say one thing when she came over or tried to pick him up, "Where's da Papa?" And, when Papa did finally come into the room, Declan's eyes lit up. He also lived for the moment after church was over when we would walk into the main sanctuary and spot his beloved grandfather. It was the same thing every time. I would put him down and he would literally run down the aisle to throw himself onto his papa's legs. My dad enjoyed it just as much. He loved being sought out and pursued by Declan. But then something happened. Gradually, Declan wanted to hold his grammie rather than his papa. He stopped asking where papa was if he didn't see him right away when we visited. Sadly, he even started resisting my father's attempts to snuggle and hug him. He wanted to "do it a me" (translation: myself). He wanted to play outside with his sisters and cousins. He wanted to be left alone. It was so sad to see my dad put on a brave face facing my son's rejection. He understood that Declan was asserting his independence. He was growing up. But, I know he didn't like it. He missed the feel of that baby skin against his cheek and that knowlege that Declan would always be looking for him. I tried to keep that affection flowing -- encouraging Declan to go and give his papa a hug and kiss. Sometimes it would work and sometimes it wouldn't. And when it wouldn't, I could see the little shake of my father's head and I knew he was thinking of those little arms winding around his neck. But it wasn't the same. So, it was a poignant moment for me this last Monday as Papa sat down on the couch next to Declan as he watched Buzz & Woody try to get back to Andy because he's been on a Toy Story kick. Mostly these days, Declan tolerates my father sitting next to him, but he doesn't really want him to get too close. So, conscious of this, my dad sat leg to leg and enjoyed Declan's presence. Being a kid, Declan lost attention on the movie and slipped off the couch to romp around of the floor with his truck. We chatted and watched him play happily. And, the most amazing thing happened. Declan dropped his toy, climbed up on the couch, put his little arms around his papa's neck and kissed his cheek and said, "I love you, Papa!" And, then after getting his hug back, he slipped back down off the couch and started playing with the truck again. We sat there a little surprised...and I have to admit...a little misty-eyed as I saw how touched my father was by this much-longed-for and unsolicited affection. It brought to mind a trip I took to Rome, Italy years ago. One of the lasting memories I have of that trip was seeing the famous ceiling of the Sistine Chapel, painted by master painter, Michaelangelo. 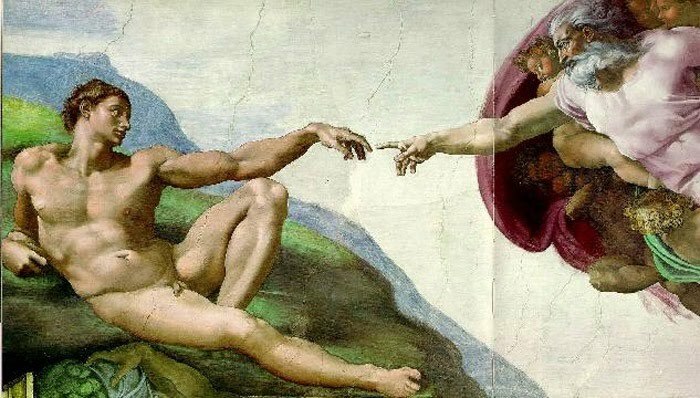 One of the things that struck me the most was the moment of creation with God reaching down and touching Adam's finger. I don't pretend to know much about art but I can admire the workmanship and mastery of Michaelangelo in the lifelike play of muscles and skin tone. However, the thing that struck me the most about this portion of the painting was Adam's hand - his limp, lifeless hand. God is stretching and straining to touch his finger to Adam's. And the best Adam can do is a relaxed and leisurely finger flop. I mean, he's resting his elbow on his knee why the creator of the Universe is attempting to touch him. Unbelievable. 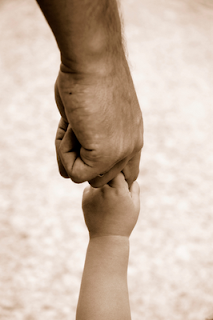 How often do I deign to lift my hands, voice, or anything to my creator, who is constantly leaning down to touch me? How often do I ignore the urgings of others to thank Him or praise Him in my attempts to do things myself. How does it feel for the Father to watch His children being bribed or goaded into showing Him the love he so rightly deserves. This thought is what smacked me upside the head on Monday. How much more must our Father God feel when unbidden we simply drop what we're doing, climb up onto His couch and throw our arms around His neck and whisper a simple, "I love you."